Deshi Han, Hong Kong’s biggest martial arts actor and director, thinks a serious relationship would hamper his career and charity works. Then on a charity trip to the Philippines, after a typhoon, he agrees to take a young American woman with complete memory loss, back with him to rest and recover. Once back in Hong Kong, Deshi reluctantly allows the young woman, whom he names Annie, to accompany him to the movie sets and on his trips across China. Despite his attempts to remain aloof with Annie, a budding romance develops between them. Meanwhile, Annie is troubled by nightmares, which reveal a danger lurking from her past, and a member of Deshi’s crew plotting to remove her from his life. Deshi is forced to change his work schedule often to protect Annie, confirming his belief about relationships and careers. But when it looks like Deshi will lose Annie, and he risks all to save her, will it be too late? 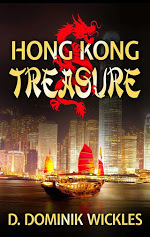 A portion of every Hong Kong Treasure book sale will be donated to the American Red Cross. To read the blog post announcing this decision: Red Cross to the Rescue!